Passiflora Incarnata is commonly known as passion flower. This extract has long been known for its ability to relax and reduce tension. Biochemical studies show that natural flavonoids are a key active ingredient and that Passiflora strengthens the effectiveness of GABA brain receptors which promote relaxation. Passiflora Incarnata is a key ingredient in nutracalm, a fast acting calming supplement for cats and dogs. 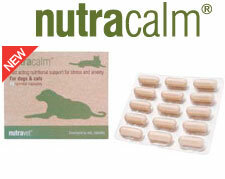 It has been specifically formulated by vets to naturally calm anxious pets and to help reduce unwanted or unruly behaviour. Concerned about your pets joints?